In Lancaster County and online you can find tens if not hundreds of places to buy Amish Furniture. Some of these businesses will focus on the absolute cheapest price, other’s focus on fancy advertising and scammy discounts. Why King’s Kountry Korner? At Kings our goal to provide the Highest Quality Amish Furniture at the best value possible! Here are a few ways we help you “Create Rooms, Not Headaches. We offer 100 mile free delivery (get your coupon below), a complete and total satisfaction guarantee, and we price match. After being in the Amish furniture business for over 30 years and selling 5,000+ dining table sets we have learned a thing or two about Amish Dining Furniture. 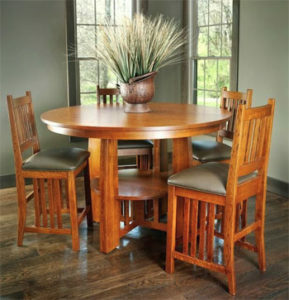 We have continually upgraded our Furniture line to offer the very best of Amish Dining Furniture. If you need a table that will wow your friends and family with good looks, while being incredibly well built we have the Amish Dining Table for you. We custom build each and every table just to your specs. You choose the size, the wood, the stain color, what base you want on the table and we build it, and deliver to you a world class Amish Dining set. Head on over to our website now to see our Trestle Tables, Post-Leg Tables, and Pedestal Tables. The environment we sleep in truly does matter. When you sleep in a Solid Hardwood Bedroom set from Kings you will notice that you sleep with a smile on your face just knowing you got World Class Bedroom Furniture at a fair price. We will help you choose the best Bedroom set for your situation and budget. 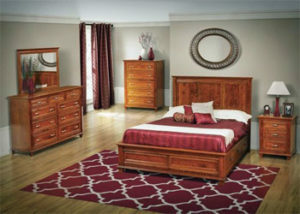 Amish Bedroom sets aren’t cheap, make sure you get a set that lasts for years to come. At Kings Kountry Korner we also carry a wide range of other Amish Built Furniture, all with options to customize right to your wishes. 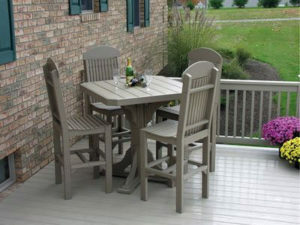 We have a great selection of Outdoor Amish Poly Furniture, stunning Office Collections, and a wide range of Home Decor. When buying Amish Furniture it is important for you to do some research as well. Reading reviews a great place to start. So check us out on Google, FB, Yelp etc… to learn more about us. Here are a few things people have said about us. We hope to see you soon on your next visit to Lancaster, PA.